﻿Homemade Potstickers. 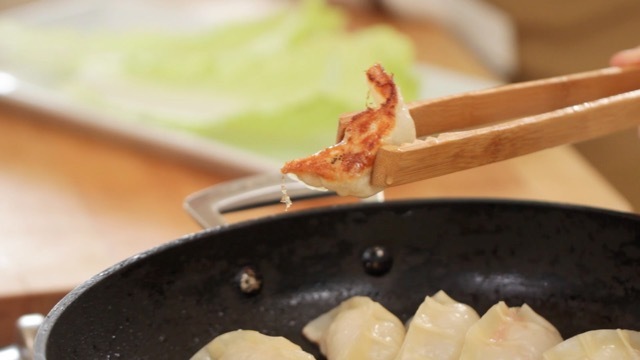 When it comes to homemade, there's nothing like these potstickers. If you already enjoy the pre-made frozen varieties from the store, I'm sure you'll love these homemade ones even more! The traditional filling I like to use is made with ground pork, shrimp, and napa cabbage. 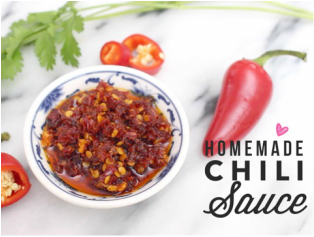 The rest of the ingredients are seasonings that you can customize to your taste preferences, but I recommend always using sesame oil. 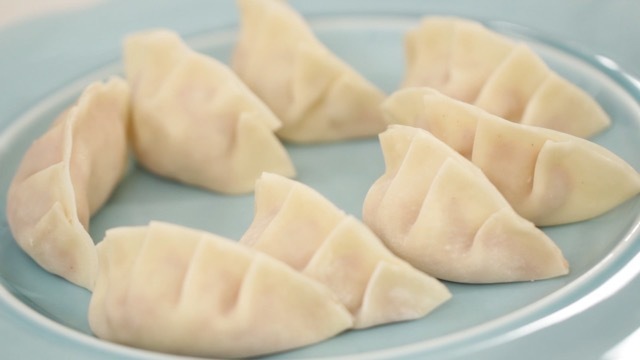 As for the potsticker wrappers, they are also sometimes sold as gyoza wrappers (look for the circle shape - not to be confused with the square shaped ones which are for making wontons). TIP: Potsticker wrappers will dry out quickly. If you need to leave them out for longer than 30 minutes, cover or wrap them in a paper towel to prevent them from drying. If you have leftover wrappers, wrap them in a paper towel, put in a plastic bag or container, then store in your freezer. When ready to use next time, simply defrost in your refrigerator. Cook Time = 12 - 15 min. TIP: I like to double the recipe and freeze the potstickers for a weeknight meal. Freeze freshly made (uncooked) potstickers on a tray ensuring there is plenty of room so they don't stick together while freezing. Once frozen, throw in a plastic bag for easy freezer storage. Start by prepping the napa cabbage by cutting the leafy parts off, leaving the white stems remaining. Chop the white stems into small pieces. Mix the chopped napa with 1/2 tsp. of salt and let sit in a bowl for 20-30 minutes. 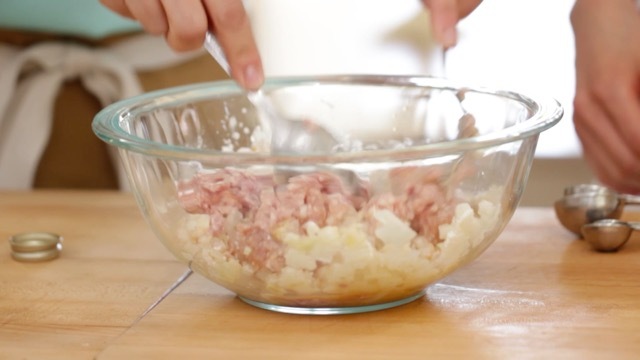 In a large bowl, mix all the ingredients together for the filling. ​Place a small spoonful of the filling in the center of a potsticker wrapper and wet the edges with a damp finger. Fold over and pleat the potstickers until all edges are sealed. Repeat and continue wrapping all the potstickers. Add 3/4 cup of water, cover with a lid and steam the potstickers for about 8 minutes or until the water has almost evaporated. Try to use a lid that has a small vent to let steam escape. 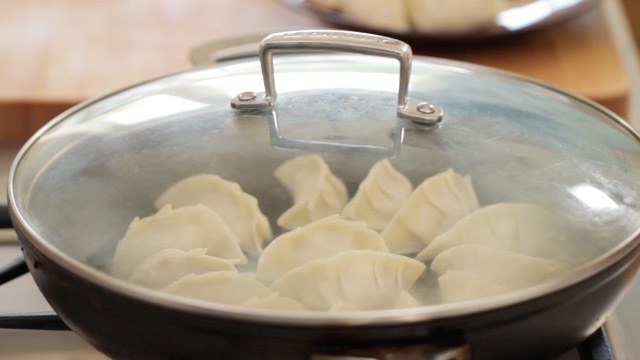 Once almost all the water has evaporated, remove the lid and let the potstickers continue to pan fry for another 3-5 minutes or until the bottoms have developed a nice golden crust.